I'm having some issues getting my father's 1975' (I think) back on the water. A little history and info on the boat. He passed a few years ago and I couldn't stand letting it sit and rot, so I decided to fix her up and start sailing it again. I haven't sailed it hard since I was in high school, so it's been about 18 years. To be honest, I didn't really know much about the boat back then, but I knew enough to stay out of trouble. Now after taking it out a few times, I'm pretty hooked. I'm trying to soak in everything that I can, learn how to trim everything according to conditions, and make sure everything is rigged properly. Upon inspecting everything, I've found that one of the side stays was the newer shorter version, so I bought a new one for the opposite side. I've extended the front shroud since the original front stay is pretty short. I'm currently two holes down from the top on the side stays, and the blocks have about 6"-8" between them when the sheet is pulled in hard. I've replaced all of the clevis pins, and looked over the sails. 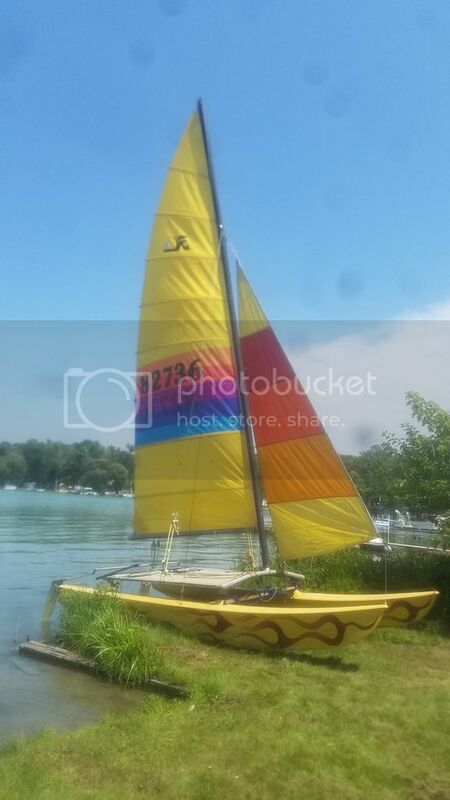 The main appears to be an 85' Nationals yellow in pretty good shape, and the jib looks to be a 75' flamer, and could probably stand to be replaced. I've replaced the once repaired main halyard, and added a 2nd trapeze. The main line is not in the best shape but is still working. The rear tiller connectors were shot, so I replaced those. The rudders were a bit sloppy as well, so I purchased some bushings and a shim kit, but have yet to install them. I haven't yet checked the toe in, however I will need to figure a way to modify the system since the older style is not adjustable. Now onto the problems. It seems as though the boat is fairly sluggish. Keep in mind that it's been nearly 20 years since I've pushed it hard, so my perception could be different these days. For example, I was out yesterday in 13mph steady, (18mph gust) winds. Downhaul pulled snug, outhaul snug, jib haylard pulled pretty tight, to where there was no tension in the side stays. Due to not having anything to brace onto, I was sitting near the back most of the time with my heel dug into the tramp lace when flying a hull, as there wasn't really enough wind to trap out, so that balance was a bit aft for a reach. Max speed yesterday was only 15mph a couple times. It would move "okay" in the steady wind, and when there was a good gust, the boat didn't really react with much of a speed increase. It would just want to blow over, and even while letting the main out a bit and steering a bit into the wind like I've always done, it just didn't feel like it wanted to "shift gears" and take off. Both the main and jib travelers were in all the way. I played around with both the main and jib trim. I didn't feel it was windy enough to depower, so they were full for the most part. There was only two reaches where it did feel as it should and really felt like I was moving good. One major thing that I noticed, which I'm sure has a pretty negative effect on the boat, is that when the gusts hit, the mast would turn and stick 90 degrees, perpendicular to the front beam, and pretty much get stuck that way until tacking. I would imagine it is tremendously hindering the aerodynamics and lift on the sail. I thought that having the jib haylard pulled too tight or the mast raked back too far prevented the mast from rotating at all, so I'm a bit confused as to why this is happening. I don't feel that the mast rake is that extreme, as I'm only on the 2nd hole from the top of the shroud adjuster (old style shrouds), and the old style blocks, which are pretty tall. Next issue is pointing. I've seen the diagram of upwind angle vs. boat speed, so I know it gets exponentially slower the more you point into the wind, but I'm only able to get about a 60 (just a guess) degree to headwind tack, making traveling upwind very difficult. If I point much more into the wind, the jib starts to luff pretty bad and the boat slows to a crawl. Any suggestions would be greatly appreciated, I'm not sure what else to try. I should also mention, I'm located at the Indiana Michigan state line between Bristol and Elkhart, if anyone happens to be nearby. I may have solved the mast over-rotation issue. I didn't realize there were limiting tabs on the mast base/stepper. I will have to take a look, but sounds like mine are worn out. It's not entirely clear from your post whether you were solo or had a crew with you, but it sounds like you were sailing solo. In 13-18 mph breeze, most Hobie 16's being sailed with two average sized people would be either single or double trapped. It sounds to me like you were overpowered and the boat was just going up on it's side rather than going forward. You probably need to ease off your traveler a little and sheet in harder to flatten the boat out rather than letting the hull fly. Regarding the mast - it is supposed to rotate from side to side, and it would actually be much worse aerodynamically if the mast did not rotate (it would essentially create a big separation bubble along the leeward side of the sail). The mast should rotate about 45-60 degrees off of centerline and be limited by the stops on the mast base. If the stops are worn or the mast rake is not allowing them to make contact, then the mast could be over-rotating to 90 degrees which is less than ideal (but still better than not rotating at all). If the boat is really feeling sluggish, the first thing I would check would be if there's water in the hulls and/or if the hulls have absorbed water and gotten heavy. I agree with the water in the hulls suggestion. Because of the shape of the hulls you have to tilt the boat back on the stern quite a bit to empty them out. Additionally, you may be having issues with balancing the boat. If you are all the way aft when beating to weather, you could be digging the stern in quite a bit more than you realize. Try shifting your weight forward, possibly past the shrouds (depending on your weight) to get the windward hull flatter in the water. When on a broad reach or a run the opposite applies, the sails will push the bow down and you may want to shift your weight aft. When sailing with friends, I always warn them that their job is primarily ballast and the better crew will actually walk out on the hulls to balance the boat. The increase in speed is immediate and quite noticeable even with 600 pounds of crew and can equal an extra 5 knots of speed depending on conditions. Yes, solo. I'm 175lbs. and I was trapping out while down on the windy side of the lake. We get gusty winds around here, coupled with being on a small lake, it makes for some very unpredictable gusts. It could very well be my sail trim that is the issue. 90% of the time I was out, the boat did not feel over powered in the 12-13mph steady wind, was relatively easy to keep the hull down, it's just when the gusts hit, they last anywhere from 5-15 seconds. One of my issues with the boat is that it still has the old traveler car, which is really hard (impossible) to move on the fly, as well as cannot be moved while trapped out. The only way I can depower through the gusts is by turning upwind or letting out the main, or usually doing both. I could set the traveler out some inches, but most of the time the wind is not overpowering the boat at all, so I keep it all the way in... unless of course the wind steadily increases too much, but I have yet to run into that issue. I can't remember there being a day when the wind was over 15mph constant this summer. I'm planning on upgrading to the newer traveler system at a later date, maybe that will help. I hear credible people on the forums and videos say to depower through the gusts, use the traveler, but also hear people say to only play the main to depower. I understand the function of both and the importance of flattening the sail when overpowered, but is this just preference? I would assume traveling out would depower more efficiently. After reading about the mast stops, I'm sure that they are worn. I wasn't aware that there ever were stops, so I will figure out a way to fix that, or order new base/stepper. Yeah, the mast rotates freely, but like I said, at some point, it is literally stopped at 90 degrees to centerline, completely perpendicular. I have an idea on how to fix it, hopefully shouldn't be too bad. Does anyone know for sure on the newer boats what the angle between the stops are? I read somewhere that it is exactly 90 degree (45 degree each direction). I did pull the plugs, no water in the hulls but I didn't think of the shape of the hulls, I never tilted the boat back, so I will check it out. Dragging the boat on/off the shore is a task for just me, but the ground is a good 10" up over the water. At one point, I had to tip it on its side, and I was able to fairly easily do it by myself. If there is water in there, there isn't much I would guess. Yes, certainly had most of the weight all the way aft. I will sit further forward and see if that helps. I guess I didn't realize that the balance was that important. I do try to keep the weight as far back as possible when running or on a broad reach. I've watched enough pitch-pole clips, haha. I had mentioned that a couple tacks felt like the boat was really moving fast (like it should) for no apparent reason, I wonder if without realizing I was positioned farther forward?? I don't think of these things while I'm out there. Thanks guys, this gives me a lot of info, hopefully there will be an improvement next time I go out. A quick update. Just as suspected, the mast stops were worn, and had about a 1/4" gap between the stops with the current mast rake. While I was in the shop over the weekend I made a 1/4" thick "semi-circle" at 90 degree that I put over top of the old base and was able to drill & tap to secure the new stops with some flat head screws. I also had to grind down the aft side of the base due to the new rake angle. There was also no bearing whatsoever, so I bought some PTFE and made some bearings. I raised the mast yesterday and tested it on the shore. The stops engage as they should now and the mast rotates very easily with the bearing in place. Glad that issue is taken care of. As far as your question goes regarding whether to use the traveler or the mainsheet to depower, the general rule of thumb is that the traveler is a "gross" adjustment and the mainsheet is a "fine" adjustment. Adjust the traveler for the lulls. So if it's a steady 15mph with gusts to 20, you would probably be travelled out say 6-8" and easing the mainsheet and/or turning into the wind during the gusts. If it is a steady 5mph with gusts to 15, then you would have the traveler centered but still be playing the mainsheet during the gusts. It's much easier to adjust the mainsheet on the fly than the traveler (unless you have a crew that knows what they're doing and the crew adjusts the traveler). Either way, having a traveler and mainsheet system that work well will make all the difference in your sailing experience since it's much easier to fine tune the power and make quick adjustments as needed. Makes sense. Aside from traveling out while running, I never really worried about the traveler in 10-15mph winds. Guess I need to experiment and see. I'm going to be upgrading the traveler soon so that I can adjust on the fly. The old system is terrible. Cruise over to Lake Street Beach in Gary. There may still be some sailors there. Maybe AlanRV8 that used to post here. Another update, getting there, but still a few things to work out. I checked for water in the hulls by lifting the front, they were dry. Went out in sustained 16mph winds with a buddy over the weekend. The mast stop fix really made a huge difference. The mast now stops rotating as it should, the boat didn't feel sluggish at all this time, felt pretty good and fast. I messed with the traveler since it was pretty windy and was able to find the sweet spot. I paid extra attention to the weight placement and making sure the boat was as flat as possible, but now another problem has come up. We kept stuffing the bow while reaching, mainly only in the gusts. We were not trapping during this outing. I assume that too much weight heavily contributed. Me being 175 and sitting up against the rear cross bar, and my friend being 208 sitting right next to me. I'm no physics expert, but just curious if one (or both) being on the wire helps at all to pull the bow up a bit, considering the leverage on the mast due to the location of the wire on the tang and the weight being aft of the center of effort? Aside from moving the weight back farther, raking the mast more (already block to block), flattening the jib, traveling the jib out, is there any other way to keep from stuffing the bow? Something also doesn't seem correct with my mast rake either, but I may have a theory as to why. So 76' boat, 7 pin side adjuster plates, old style main pulley system (two on the boom next to each other, and two on the traveler, on top of one another), and new length side stays. 2nd hole from the top on the adjusters puts me block to block. I'm guessing the old vs new blocks gives about 5" more distance. 5" give or take would probably put me 2 or 3 holes farther down on the adjusters right? I'm still getting terrible pointing ability, looking at my gps tracker, I'm getting barely 70 degrees to headwind. Does mast rake make that big of a difference in pointing ability? I've been making some progress with the boat recently, trying to get as much accomplished as possible before the water gets too cold. Converted the seaways to 6:1 triple blocks to get the stack height down. I'm able to rake the mast back plenty far now. Aside from the benefit of depowering, seemed to help slightly with pointing and digging the bows in, but not much. I also recut the jib due to the extra rake causing the geometry change, which I'm now able to adjust tension to the point that it is even between the foot & leech. Biggest benefit so far was adding a 6:1 downhaul. Seems that since I was barely able to pull the downhaul, there was a huge draft in the sail, contributing to poor pointing and pushing the bows down in stronger wind. With being able to flatten the sail a good bit, the bows are not constantly shooting for the bottom of the lake, and I can maintain a better upwind angle. I also noticed that there is excessive flex between the hulls due to slop in the framing. Next spring I will be epoxying in order to tighten things up. Converted rudders so the rake can be adjusted, almost have them dialed in. They were also toed out about 1/4", which I imagine creates excessive drag, making tacking a bit more involved. Yesterday I modified the tiller cross bar so that I can adjust the toe angle. It's now right around 1/8" toe in, hopefully get to test it out in the next day or two to see if there was a noticeable improvement.